We will be back for Labor Day, with the rest of our family! Can't wait! The first full day we were on the property we realized the jetted tub was not working. We spoke with a team member who was extremely friendly (and funny). Within an hour maintenance had already been to the property and the issue was resolved. We enjoyed every aspect of our stay! The property was beautiful and well maintained and we couldn't have asked for a more beautiful location. 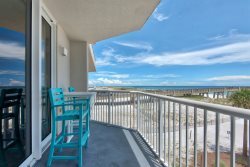 We enjoyed the relaxing atmosphere of Navarre Beach while enjoying the convenience of being so close to Destin and Pensacola if we wanted more adventure! I enjoyed my stay very much. The beach was not real crowded. Will definitely chose your properties again. Gorgeous place. Great amenities right there! The property was very clean, well decorated and had everything we needed! The experience was first class and we would recommend your company to all of our traveling family. The property was perfect and just what we were looking for.